In The Andalucian Friend I have to admit to being somewhat lost through the beginning as author Alexander Soderberg developed his characters. Though this is not my favorite format the author quickly got to the point where connections were made. Set mostly in Sweden the characters are very interesting in that the traditional bad guys and good guys don’t always follow expected norms. This is not your typical criminal investigation novel as there are very few sympathetic characters and the ones that may be have checkered pasts. 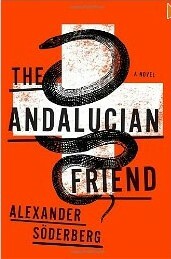 True evil in The Andalucian Friend may not rest with the gangster. I enjoyed the story and found the prologue “cliff-hanger” an interesting way to start the book. The cast of characters had about every base covered except the “angel” or hero that is typical of most books. The novel never got to the “can’t put down” stage, but it did bring me to the point where I stayed up to finish the last fifty pages. This article was published on Mar 28, 2013 . It is tagged alexander soderberg, andalucian friend, criminal, novel, sweden. You can follow any responses to this article through the comment RSS feed.